Update October 2013: Read about our new favorite training pants made by Hanna Andersson in this post. I bought disposable training pants once when we were traveling and our first child was not yet fully potty trained. I was shocked by how expensive they are! 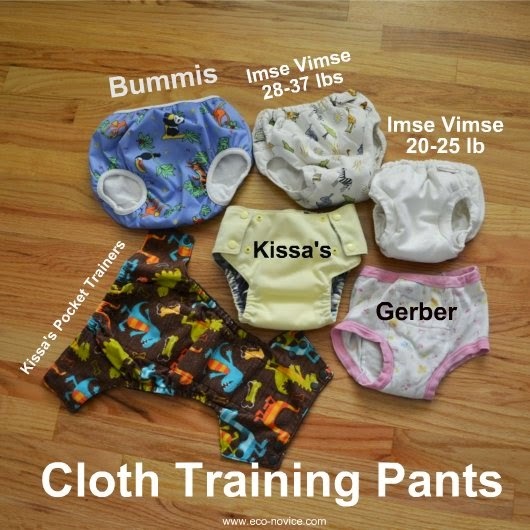 Even if you have never used cloth diapers, consider reusable training pants. 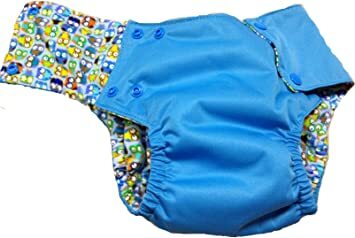 They feel much more like actual underwear and provide an excellent contrast to disposable diapers, so your child will fully grasp that this is not business as usual. 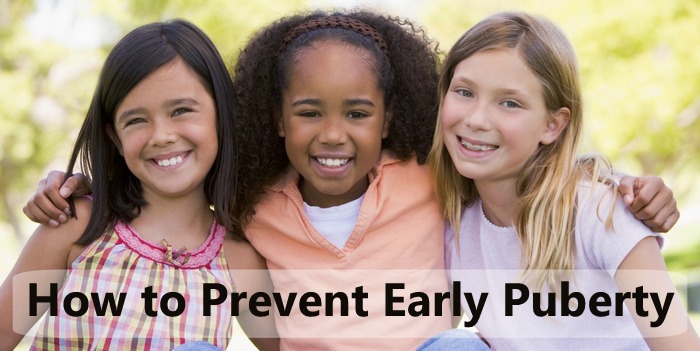 Your child will also immediately feel when they are wet, and, if the training pants are not completely waterproof, may even end up with damp pants as well (this can be very motivating). And as long as your child's poops are solid enough to roll off the training pants into the toilet, you'll mostly just be washing pee (no big deal, right?). Very little absorption. More absorption than regular underpants, but not much. Best for catching little drips, not full-blown accidents. Not at all waterproof, unless you want to add some plastic pants. I recommend these Dappi waterproof pants, because they are nylon instead of vinyl. 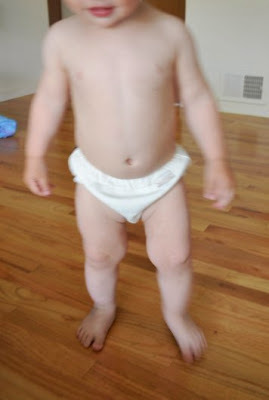 These plastic pants are noisy/ crinkly, however. Very easy to pull up and down. 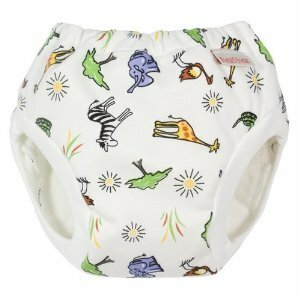 Unlike most kids' underwear these days, the elastic is completely encased in cotton fabric, making these easier for a small one to pull up and down. With no way to open the sides, however, a pasty poop can be very messy. OK fit. Unfortunately, I have never tried the smallest size (18 month), so I can't comment on those. The 2T size is pretty big but usable on a baby or young toddler. They will stay on, but would not contain a messy poop because the leg holes are too big. Size 2T does not provide a super snug fit around the leg even for a 2-year-old. 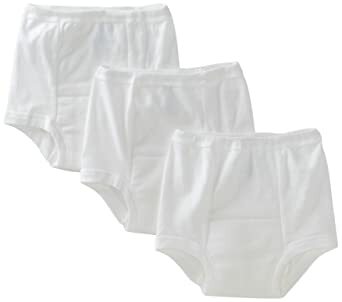 The advantage of buying 2T rather than 18 months is that you can then just use these as regular underwear for your 2 or 3-year-old once your child is fully trained. Very comfy and not at all bulky. Just like underwear. We use these when we are quite sure there will be no accident (toddler has just peed) or when wet pants and a puddle are not a big deal (playing outside). We also use them as regular underwear once potty trained. My 4-year-old still wears her old 3T ones because they are much more comfortable than regular preschool underwear because of the thicker material, covered elastic, and generous fit. $3 to $4 a pair (sold in packs of 2 or 3). Your least expensive option. For a similar pair of trainers in organic cotton, check out those made by Under the Nile or Hanna Andersson. We've never used these but I've heard good things about them and I believe they are very similar in thickness and absorption to Gerbers trainers. Lots of absorption. If you catch even a full-blown accident fast enough, you will have only slightly damp pants and no puddle. Only a little bit waterproof. There is a PUL layer in there, but it does not stand in the way of a full bladder. I actually prefer this to completely waterproof training pants most of the time because both my toddler and I know immediately when she's wet and I change her right away. However, if you need completely waterproof, you can pull the plastic pants mentioned above over the Imse Vimse pants and there will be no leaking. Very easy to pull up and down. Along with the Gerber trainers mentioned above, definitely the easiest for my kids to pull up and down on their own. Great fit. 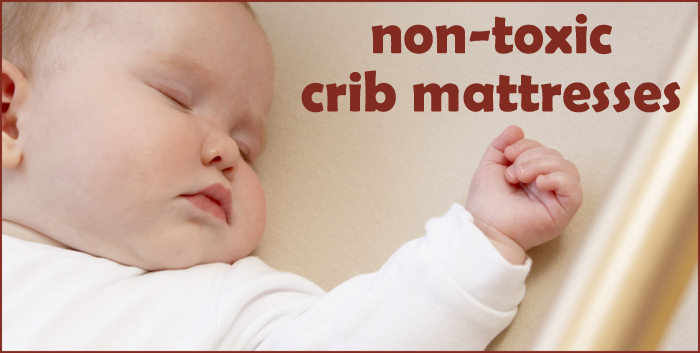 Their smallest size (20-25 pounds) is the best fit you'll find for under one year. I have been using all three of the following sizes since my current trainee was 9 months up until now (she is now 20 months old and about 27 pounds): 20-25 pounds, 24-31 pounds, 28-37 pounds. The smaller sizes of course fit my 9-month-old better, particularly around the thighs (and the smallest size is getting a bit snug on my 25+ pounder) but all sizes have worked with a variety of ages and weights. The larger sizes absorb more just because of their size. Very comfortable and only a little bulky. They feel just like soft underwear. Bulkier than regular underwear but trimmer than most cloth diapers. The smallest size is quite trim on my toddler. Best training pant to use for the under-one set. We use these training pants more than any other because they prevent massive accidents but also make it easy to tell when child has gone pee, whether a little or a lot. $17 to $20 per pair. Keep in mind that these are made with organic cotton, which for me partly justifies the higher price tag. Available in numerous sizes/ weight ranges: check the weight parameters carefully before purchasing! Also available from Jillian's Drawers (which often has a better variety of sizes available than Amazon). Very waterproof. I've never had these leak. Medium difficult to pull up and down. So-so fit. Medium (30 to 40 pound) size fits my 27-pound toddler OK. I've used these with a 2yo and 3yo too and never felt the fit was great. Not very comfortable: very bulky and a little bit crinkly. My toddler visibly dislikes these, although she'll tolerate me putting these on much better than laying her down to put on a diaper. We use these when we need a waterproof training pant but we're out of Kissaluvs, or I'm out of everything else. I most often keep this as an emergency extra pair of training pants in a bag or the car. I purchased these because they were the most affordable waterproof option I could find. My least favorite training pant. $12. Bummis has a redesigned slightly more expensive training pant which I haven't tried. Cotton flannel print interior, hidden microfiber soaker, PUL solid exterior/ shell. Good absorption. It's also a pocket diaper so you can theoretically fill it with more stuffing, although the pocket is very small. Much smaller than a BumGenius pocket diaper, for example. I've managed to stuff a cloth wipe or two or an infant prefold folding lengthwise inside. I most often use it without stuffing. Pretty difficult to pull up and down. These really fit more like a diaper than training pants. You can leave the snaps loose, especially the top snap closer to the waist, but I still find that pulling them up and down is a little awkward and probably pretty difficult for an older toddler to do on her own. However, and this can be very important, side snaps make these the least painful option for poopy accidents of the softer variety. OK fit. We're using the 2T size (also available in 3T). Truth is, if you make them fit snugly, then they are harder to get up and down, so you sort of have to choose. Snug around the thighs/ waist or easier to get up/ down. You can't have both. Pretty comfortable and pretty trim. About the same bulk as a very trim cloth diaper. 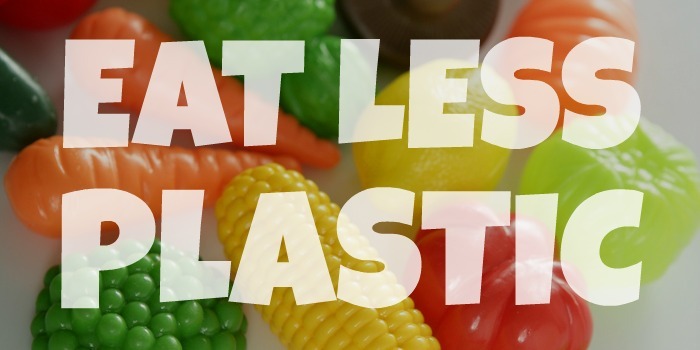 Elastic at waist and thighs is not as comfortable as the Gerbers or Imse Vimse due to plastic shell. We prefer these when we need a totally waterproof training pant, like during church, or when there could be a pooping accident. I also use these as my night-time diaper. My toddler almost always wakes up dry, but these just provide a little insurance just in case. They also have a stay-dry fleece on the inside, which I figure would be more comfortable than cotton if she does end up sleeping on a wet diaper. 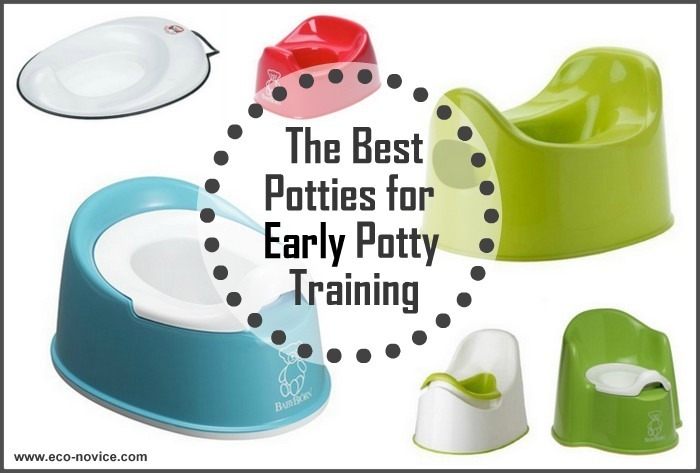 You can check out all my favorite potty training gear here. 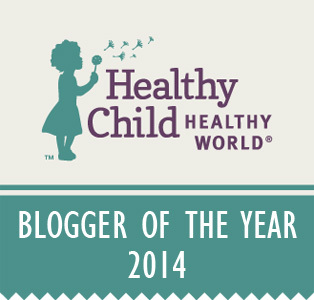 For more tips, tricks, and tales from our potty training adventures, CLICK HERE. What is your favorite reusable training pant? I'd love to hear about your experiences with these and other brands of training pants. Disclosure: This post contains Amazon affiliate links. Your purchase via these links helps support my blog, which I very much appreciate. Read my full disclosure policy here. 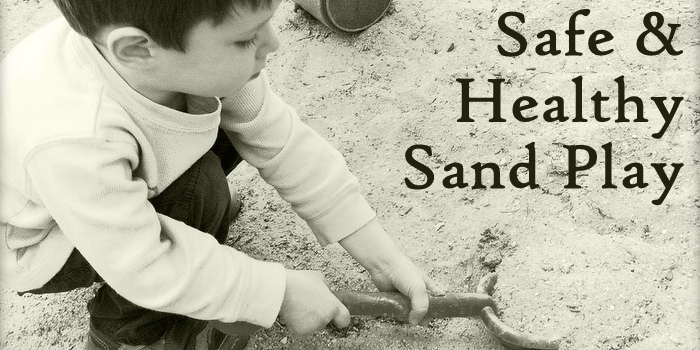 Is Your Baby Lotion Safe for Babies?